Dynamic time and weather won't be an option in the latest Gran Turismo game. If you're not clear on what that is, it means GT Sport will allow cars to move while the sun and general weather patterns remain intractably fixed in the sky and/or beyond the horizon; whatever options you pick for the start of the race is also how it will look at the finish line. 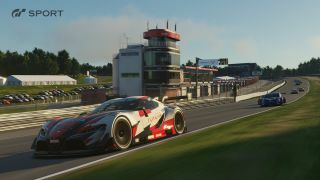 Certain tracks in Gran Turismo 6 allowed for changing time-of-day and weather patterns, which are both factors that obviously affect real-life races. But series producer Kazunori Yamauchi told GTPlanet that, in this case, allowing for more freedom wasn't worth the performance trade off. Yamauchi also confirmed that Gran Turismo Sport will include 20-car starting grids for the first time in the series' history. It may even allow more cars on the track, but Yamauchi said the studio will prioritize keeping the game's performance synthetic-oil-smooth first. It's planned for release on November 16 in the US and November 18 in the UK.